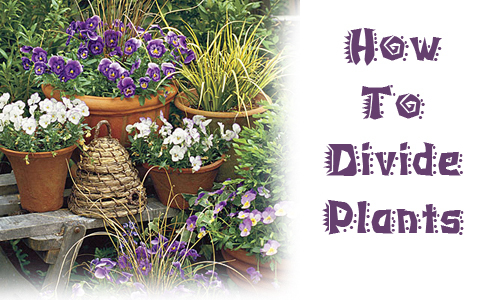 Here is a simple perennial division calendar that will assist you throughout the year when it comes to dividing plants. Spring: Divide potted perennials that flower from midsummer to fall as well as those grown primarily for foliage. The earlier you get the job done, the longer they will have to settle in before they really need to get growing. Summer: Finish dividing spring bloomers in early summer, then take a break since mid-summer is not a good time to divide most actively growing perennials. At the end of August, dividing can start again. 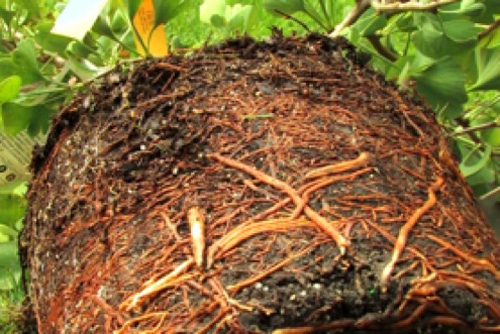 Fall/Winter: Finish dividing potted plants by early fall so there is time for new roots to grow before winter. From late fall though winter, check on plants you divided earlier to make sure freeze and thaw cycles have not pushed the crowns out of the soil Cover any exposed crowns and roots with sol or mulch until you can replant them in spring. * Water the clumps to be divided the day before. * If top growth is good, cut back so it's easier to see what your doing. * Discard dead or weak looking portions from the center of the clump. * Get the divisions back into the ground quickly. Don't let them dry out. * Use a large knife to divide tight clumps of perennials. * Divide clumps without lifting the entire clump. Cut a portion off the side. The Doughnut Syndrome: Divide if you see a perennials with an empty center surrounded by a ring of vigorous growth. Replant the healthy looking parts and discard the rest. Break it up: If you can easily see or feel that a perennial crown is rather loose, you can probably break it apart by hand. 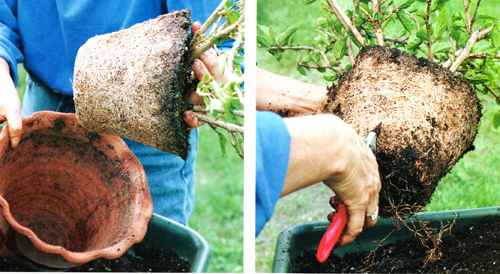 Replant or repot each piece provided it has top growth and roots. 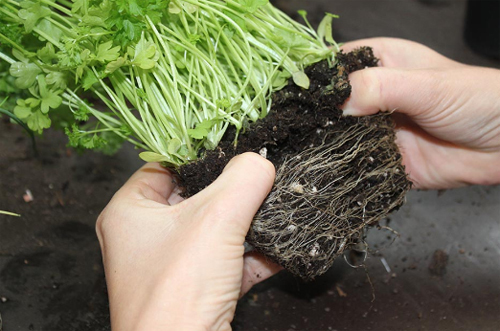 Dig out plugs from carpet-form perennials with a trowel. Fill the holes you leave with soil or a soil compost mix. Dividing perennials, potted or not, serves a number of important purposes, It rejuvenates tired, old plants, improves bloom production, encourages stronger stems and decreases disease problems. Plus, on plants that are too vigorous, frequent division slows down their spread, which is of special value to those with limited space. As a bonus, division gives you extra plants to share with others or barter for varieties you would like to add to your garden. Remember: "The first year they sleep, the second year they creep, and the third year, they leap".